Sometimes the best meals are the simplest. We must have made cauliflower soup a million times. But it never fails to be “just right.” It’s easy and filling, but feels sophisticated enough to share with company. Even a novice chef can make this! Preheat oven to 425. 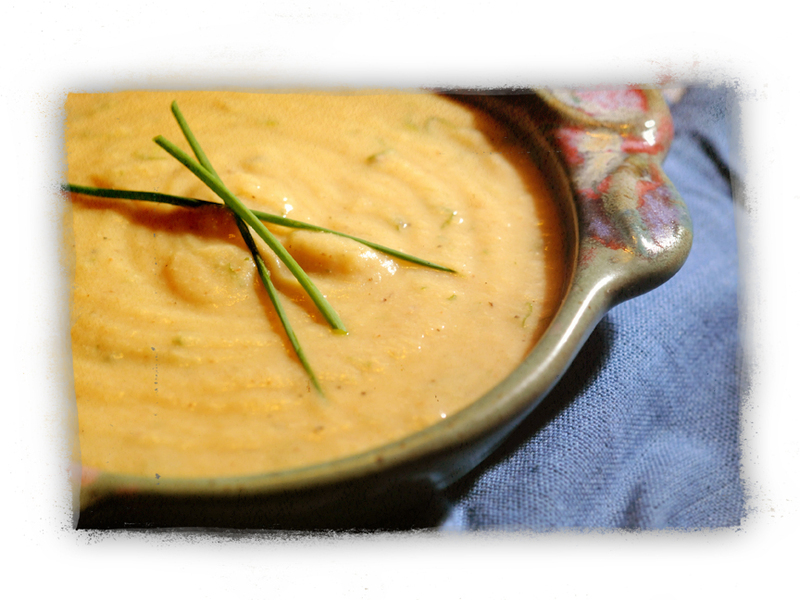 Coat a large casserole dish with non-stick spray and place the chopped cauliflower, onion and whole garlic cloves in. Season with salt and pepper and cover with foil. Roast for 30 minutes and stir. Place bake into the oven for another 30 minutes uncovered. When the cauliflower, onions and garlic are roasted, move into a large soup pot and add vegetable stock, water and herbs. Simmer, covered, over low heat for 15 to 20 minutes to develop flavors. While we live in the Baltimore area, we get around quite a bit thanks to our work. Recently, we visited Ithaca, NY. Turns out there are some pretty awesome and green things happening up there! First, if you’ve never been to Ithaca and you love gorgeous outdoor vistas and views, you gotta go. The area around Ithaca is home to the Finger Lakes as well as dozens of gorges and waterfalls. You can hike, camp, kayak, sail, ride horses. All that. 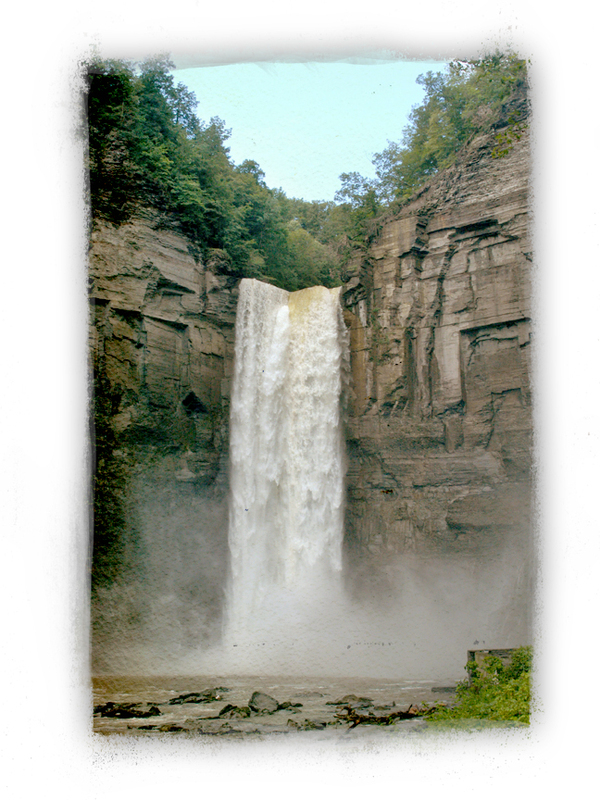 And just north of Ithaca is Taughannock Falls – which has a vertical drop three stories higher than Niagra Falls. There are some good vegan eats in the area, too. If you’ve been a vegetarian or even slightly interested in vegetarian food for any length of time, you’ve heard of the Moosewood Cafe, which makes its home in Ithaca. 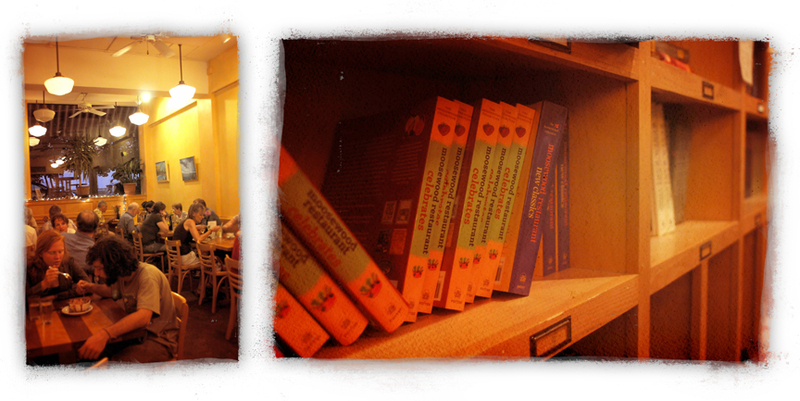 This place is like Mecca for vegetarians – I remember the Moosewood Cookbook as my first step into meatless meals. 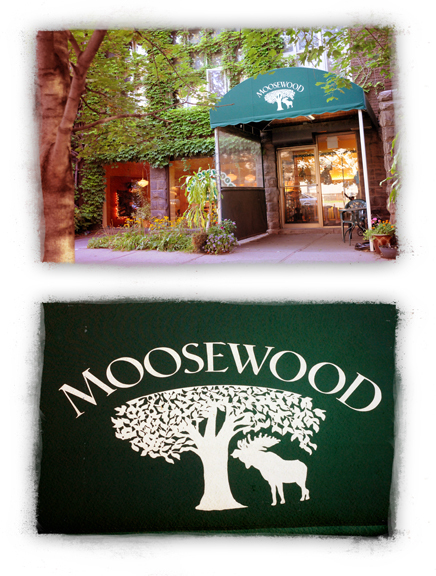 Moosewood is hugely inspiring and eating there in person is almost spiritual for me. Founded in 1973, it has been described as one of the most influencial restaurants of the 20th century by Bon Appetit magazine for its creative approach to vegetarian cuisine. Originally associated with famous veg cook, Mollie Katzen, who went on to write 16 cookbooks, Moosewood is currently a collective of 19 people. They have 12 cookbooks of their own and we own several – they are very good. 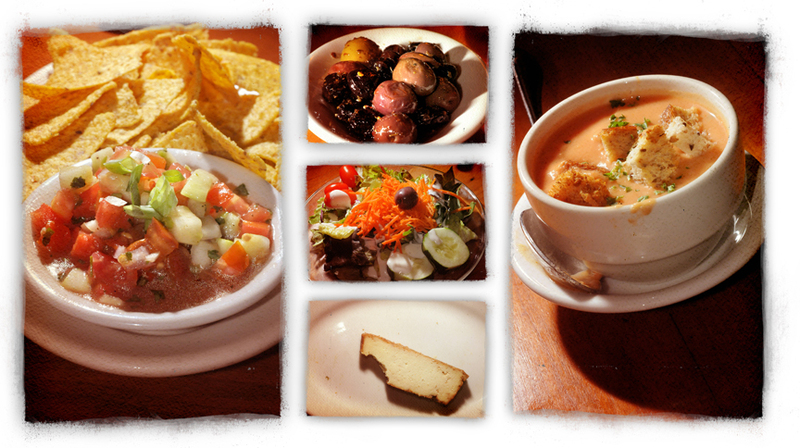 Appetizers of house-made salsa with chips (vegan); an olive plate (vegan); cream of tomato soup (vegetarian); dinner salad (vegan); smoked tofu (vegan). The tofu was so delicious, it didn’t even last for a picture. 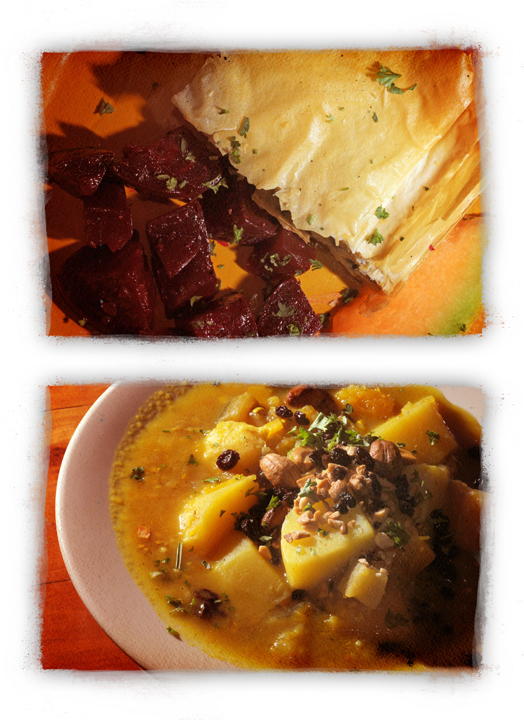 Dinner entrees of a Mediterratean pastry with beets (vegetarian) and a spicy curry with squash and eggplant over brown rice (vegan). We had a dairy-free coconut pudding for dessert and the cafe’s noted vegan chocolate cake. You can’t eat all your meals at Moosewood. Sorry. They’re only open for lunch and dinner – but no worries. You can grab loads of insane veggie eats at the Ithaca Bakery. Now, when you walk in and see all the meaty menu items, don’t despair! These people really “get it” when it comes to vegan and vegetarian food. Plus they are super into local and green business as well. You can compost and recycle here after your meal and they even use eco-cups, cutlery and plates. It’s a win-win-win for everyone. You could make a meal out of just the baked goods at Ithaca Bakery. They make bagels and incredible vegan breads. You can get Tofutti vegan cream cheese. And there’s also a display of vegan treats like cookies, brownies, quick breads, whoopie pies and muffins. In a hurry? 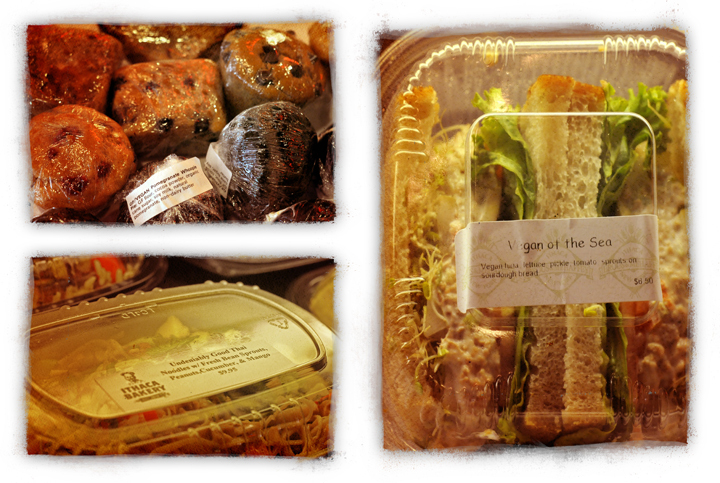 They have a case with pre-made salads and sandwiches, too. The menu on the wall has 14 vegetarian sandwiches and six vegan offerings. 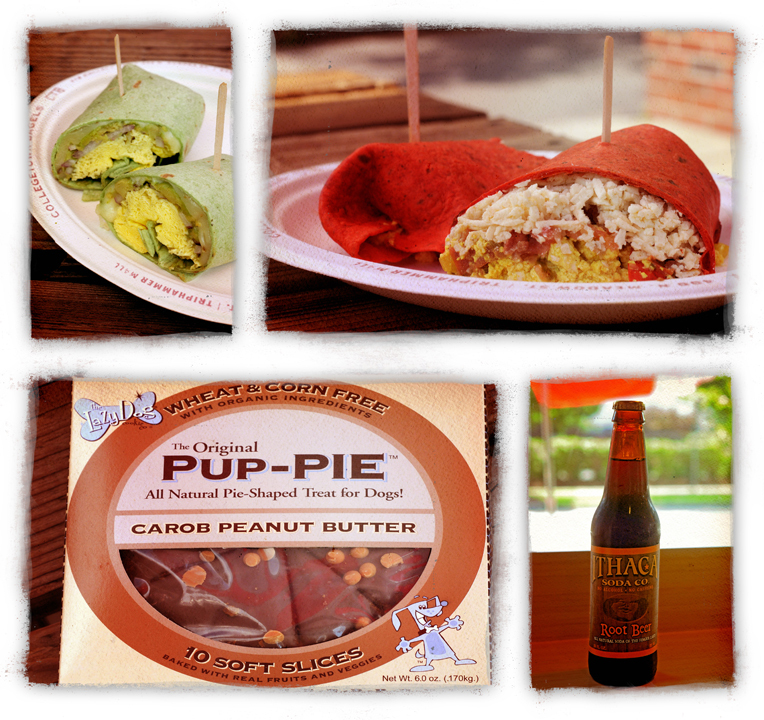 Lots of the other sandwiches can be altered to make a custom vegan sandwich or wraps. You can also “build your own” sandwich with all veggies, vegan “chicken” salad, seitan, hummus, pb/jelly, or vegan mozzarella. The Dirty Hippie loved these vegetarian sandwiches: Sherwood Forest (balsamic marinated sliced portabello, tomato, house-made pesto, mozzarella on ciabatta); The Zorba (spinach, cucumber, artichoke, tomato, red pepper, feta & olive spread topped with oregano and lemon vinegarette); Cayuga Croissant (avocado, tomato, mushrooms, sprouts and parsley-garlic dressing on a croissant). The Bohemian Girl recommends her vegan favorites: Susie’s Garden (seitan, vegan mozzarella, avocado, lettuce, tomato, sprouts on oatmeal wheat bread); The Fusion (lemon teriyaki seitan with caramelized onions, fresh spinach, banana peppers on oatmeal wheat) and her own invention… vegan chicken salad with lettuce, tomato, sprouts on rosemary foccacia. During our last stop at the Ithaca Bakery, we had breakfast wraps (they’re served all day) that looked just delicious: vegetarian Huevos Sonora (scrambled eggs, avocado, fresh salsa and cheddar cheese in a honey wheat wrap) and vegan Tofu 4 U (scrambled tofu with onion and spices, fresh salsa and vegan mozzarella in a tomato wrap). Our hound had a vegan peanut butter/carob Pup Pie treat. And of course, we shared a fabulous local root beer. Which was so good. Why not pack up your lunch from the Bakery and head out for some wine tasting on the Finger Lakes? There are literally dozens and dozens of wineries, as well as a cidery, breweries and distilleries to pick from. 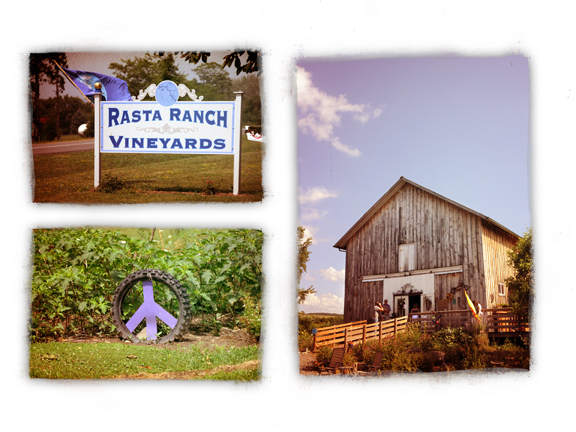 Allow us to recommend a quirky favorite… the Rasta Ranch. 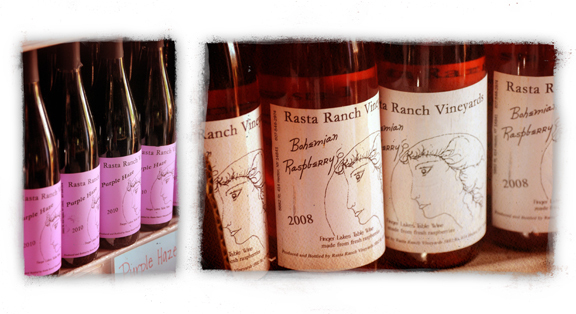 If you are a fancy-pants wine drinker, you will not love the Rasta Ranch. If you are a dirty hippie, you will feel right at home. The winery and tasting room is in an old converted barn. You immediately know it’s not your usual winery when you pull in. There are peace signs in the garden and a long-haired dude with a beard and tie-dye shirt greets you at the door. 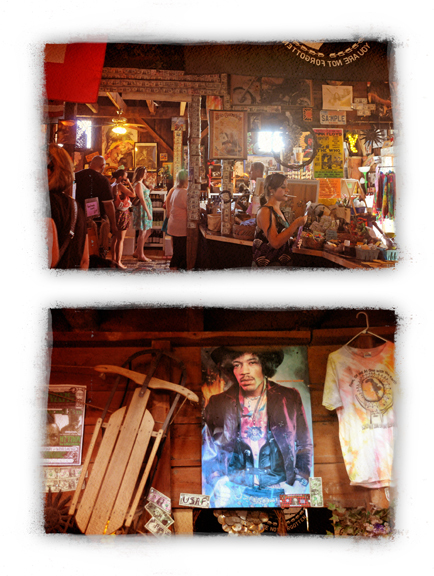 Inside is a substantial collection of hippie memorabilia. You will marvel at the posters, tickets and other goodies from the 60’s and 70’s. There are hippie tops, dresses, jewelry and more for sale – like incense and decor items made from recycled cans. And for the wine itself – you can buy a bottle. Or a jug. Love it. Tastings are $2 and the pour is always generous. Try Uncle Homer’s Red – it’s sweet, but good. Other notable bottles: Piece of my Heart, Purple Haze, Whiter Shade of Pale and Catawba Dry. The bottles and jugs are all very reasonably priced. Perfect for sharing over lunch on the winery’s deck with those sandwiches you packed. There are loads of other wineries on the same road, too. We also love the wines at Atwater Estates Vineyards, Hazlitt 1852 Vineyards and Leidenfrost Vineyards. These are all a bit more fancy-pants. Heading to Ithaca? Try staying a Brookton Hollow Farm Bed and Breakfast. They have a full vegetarian breakfast on an organic farm with solar panels. Love that. To keep you busy… Try the Farm Sanctuary in Watkins Glen to hang with rescued animals of all kinds. Follow one of the wine trails: Cayuga Lake Wine Trail; Seneca Lake Wine Trail; or the Keuka Lake Wine trail. They all have discount passes as well as special events running all year long. Rather check out art? Try the Ithaca Art Trail. You can experience 50 artists in the area. There is also the Corning Glass Museum, Cornell Botanical Gardens and more. 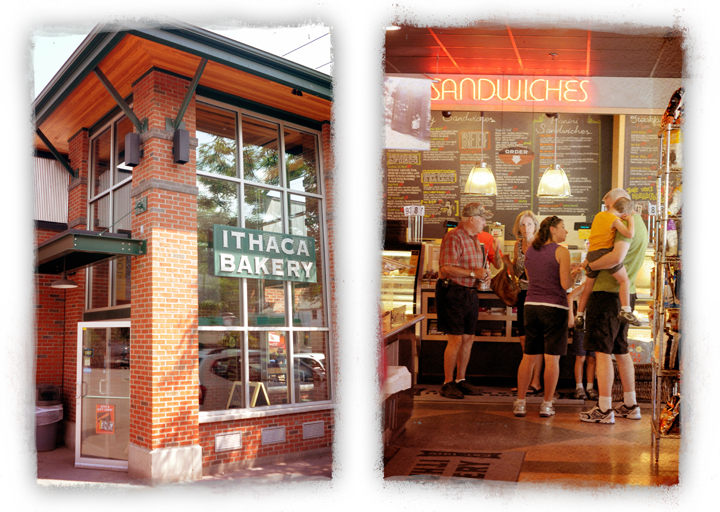 Be sure to use Ithaca’s official visitor site to help plan your trip! We love sweets around here. Especially chocolates. 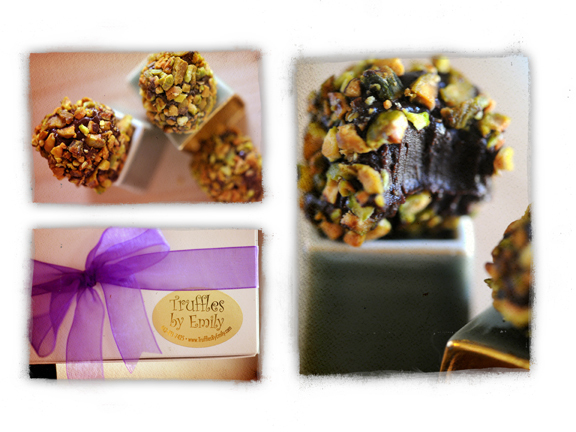 Locally-based Maryland chocolatier Truffles by Emily makes a very fine vegan truffle with a dark chocolate middle, lightly flavored with pomegranate and rolled in salty, crunchy pistachios. You might even say it’s good for you. If you need to make excuses for eating chocolate truffles. You can order these online right from Emily herself in boxes of two, six or twelve. Go for at least a box of six. If you don’t, you’ll be bummed out when you don’t have any more decadent pistachio pom truffles to savor. 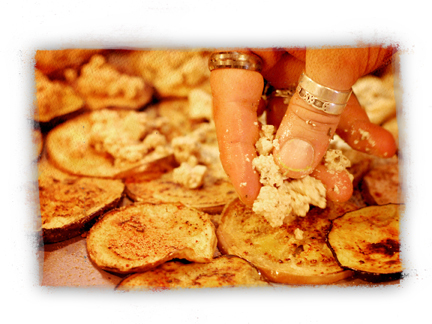 Trim the ends of the eggplant and cut it into 1/3 inch thin slices. Spread the slices in a single layer on a large cookie sheet or casserole dish. 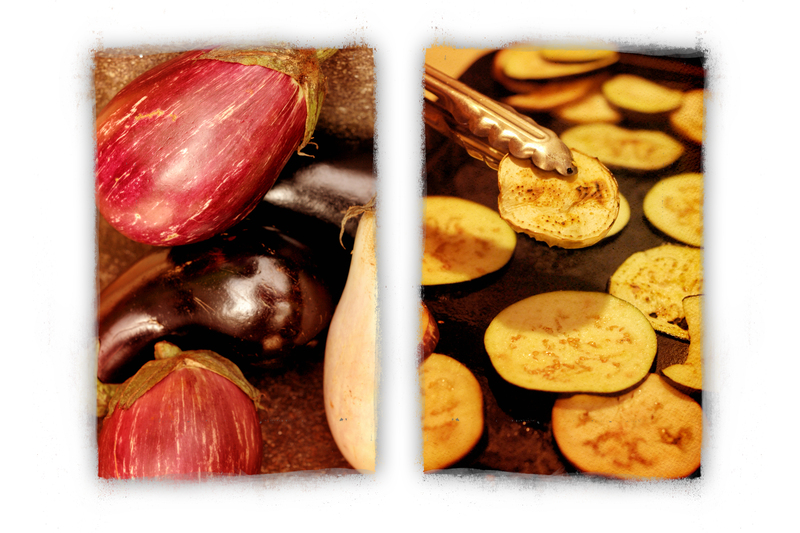 Sprinkle salt liberally over both sides of the eggplant, rub it in gently and cover with layers of paper towels. Set aside eggplant discs to sweat for about one hour. When it’s ready, the paper towels will be very moist. After the eggplant has sweat, pre-heat broiler and pan-sear the eggplant discs in a pan with olive oil until slightly brown and crisp. 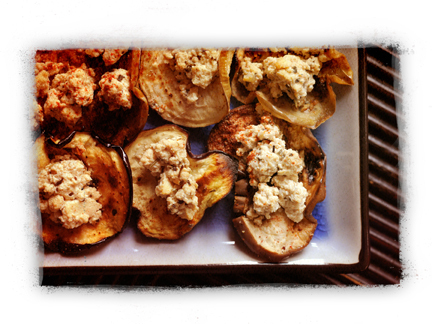 Spread pan-seared eggplant back onto cookie sheet/casserole dish and top with about a teaspoon each of vegan “feta” and sprinkle with smoked paprika, red pepper flakes and dried oregano to taste. The red of the paprika and red pepper flakes will look gorgeous when this is all done! Broil for 2 to 5 minutes, until browned and crisp. Serve warm. There are lots of recipes around for vegan “feta cheese.” This is our favorite and was found on a groovy website called The Happy Herbivore. We don’t think it can be improved upon, however, we can tell you for sure – if you can make if the day before and let the flavors really soak into the tofu, the eggplant crisps will be even more delicious & savory. Break tofu into a few large pieces in a mixing bowl and set aside. Whisk all remaining ingredients except nutritional yeast together. Pour over tofu and mix with your hands, crumbling the tofu into smaller pieces as you go. Set aside and let rest for 10 minutes. Sprinkle 1 Tbl. of nutritional yeast over top and mix. Add more nutritional yeast if desired. In the beginning, there was breakfast…And why not start at the beginning? We love to start our day with breakfast together. Its the Dirty Hippie’s favorite meal of the day. 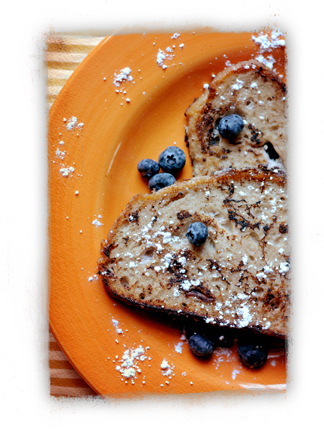 Today’s selection: Blueberry French Toast. It’s fast, crazy easy and filling. Don’t like blueberries? You can easily convert this simple recipe for strawberry, orange or your favorite flavor. It’s all good, Baby! Toss the silken tofu, preserves almond milk and cinnamon in a blender. Puree until smooth and all purple. Gorgeous! In a low dish, soak both sides of each slice of bread in the tofu blend. Coat well and toss into a warm skillet or griddle with desired amount of Earth Balance. Don’t saute over high, the tofu blend will scorch. Use gradual heat and the French toast will be crisp and heavenly in no time. Serve warm sprinkled liberally with fresh blueberries, powdered sugar and maple syrup. Wanna change it up? No thang! Substitute strawberry jam, orange marmalade, apriot preserves and serve with a coordinating – or totally contrasting – fresh fruit on top! Many happy mornings to you!